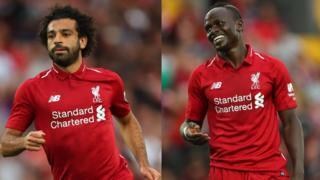 African best player Mohamed Salah and Senegal international player Sadio Mane make di 55-man list for FIFPro World XI. Dis na di first time wey Salah and Mane go make dis list wey also get Cristiano Ronaldo and Lionel Messi. Di Africans help dia team Liverpool reach Champions League final wey dem lose to Real Madrid and represent dia kontris for World Cup. Dis list dem compile am from di votes of 25,000 footballers from 65 kontris. Dem ask players to pick one goalkeeper, four defenders, three midfielders and three attackers wey play well for 2017-18 season. Juventus player Ronaldo na regular customer for di FifPro World XI, im name neva comot from dis list for di past 14 years now. 2005, na di first time im name first show for di list, anoda ogbonge player wey dey di list na Paris Saint-Germain forward Neymar Jr.
For 2017 di three attacker wey dem choose for di FifPro World XI na Ronaldo, Messi and Neymar and dem go dey hope to keep dia position wen dem announce di team for di awards ceremony for London September 24. World Cup Golden Boot winner Harry Kane name also dey. Gareth Bale, Alexis Sanchez, Raheem Sterling, Sergio Aguero and Gabriel Jesus names no dey di list.